The Cryin' Shames line-up was a little younger than those performers that had originally put Merseyside on the musical map. They are not one of the better known groups to have emerged from Liverpool during the 1960s. To make matters worse, there was a Chicago group with almost the same name- "The Cryan' Shames" who were around at about the same time. Although the Americans were almost unknown on this side of the Atlantic, it is that group- not the "Cryin' Shames" that appear in most biographical references. Sadly, the spelling of the names of both groups has not been entirely consistent which hasn't helped matters! The "Cryin' Shames" originally called themselves "The Bumblies" and were among the many competent groups on Merseyside during the mid 1960s. They had little luck in attracting interest from Record companies- probably suffering from being a little late on a Merseyside scene that was already beginning to fade a little by the end of 1965. They decided to approach the independent producer Joe Meek despite the fact that this sound engineering genius had possibly never fully come to terms with the Liverpool sound. Fortunately, the freshness of their performance impressed Meek and their first single was taken up by Decca- the group were newly credited as the "Cryin' Shames". With 'Paul' Crane's lispish vocalisation of the Bacharach penned lyrics this original record was unfortunate not to attain a higher chart placing. It has subsequently- like most of Meek's work- become a collector's item and sales benefitted from later re-issues. It was destined to be Meek's final chart hit before the ill fated day in February 1967 when he committed suicide. Two more singles followed, each recorded at further sessions produced by Joe Meek. By the time of their final session the group's line-up had changed substantially from their Bumblies days- maybe they weren't altogether happy with their progress. The former Bumblies' member Ben Bennett had been replaced by Richard (Ritchie) Routledge even before their first release with the group's new name and Crane and Routledge became the dominant musicians in the new line-up. 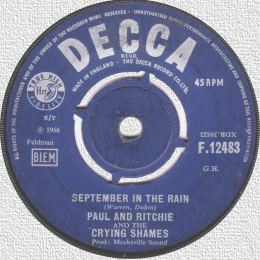 In fact, their final release, one of Meek's very last productions- the highly collectable "September In The Rain" was credited to "Paul And Ritchie And The Crying Shames". With the demise of Meek the group split up. Paul Crane joined former Walkers Brother, Gary Leeds in "Gary Walker And Rain" and made further recordings , but the Cryin' Shames sole hit remains his most memorable work.